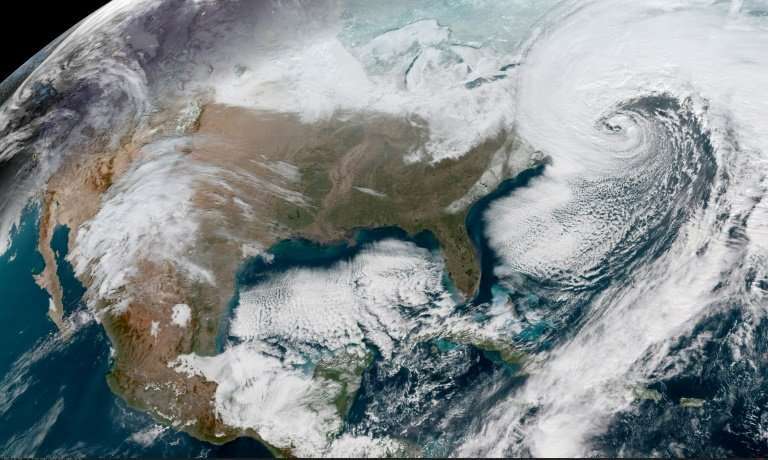 A new project harnessing data from a Japanese satellite could improve weather forecasting and allow officials to issue life-saving warnings before natural disasters, researchers say. The project is the first time that "infrared radiation luminance data" has been used to model weather patterns in areas under heavy cloud cover that would usually stymie such modelling. The breakthrough is the result of pairing data collected by Japan's Himawari-8 weather satellite with a programme run on a supercomputer at the country's Riken science institute. "Himawari-8 is sending kinds of big data that were not available before," said Takemasa Miyoshi, the team's leader at Riken. "We are now able to build a system that uses those data to improve the way we predict weather." The modelling system allows meteorologists to gauge the height of the top of clouds, vital information for estimating other factors including wind, temperature, and the volume of moisture in the atmosphere. The team, whose research is being published in the Monthly Weather Review and the Journal of Geophysical Research—Atmospheres, said the programme could help improve forecasting during extreme weather. During events such as hurricanes and typhoons, the ground-based and airborne monitors traditionally used by forecasters can become unreliable or inaccessible. But the system developed by the Riken researchers would continue to function because it uses data captured from space. The Himawari-8 transmits new data at 10 minute intervals, helping provide an up-to-date picture that could give local officials a head start in issuing evacuation warnings. "The strength of this system is it gives you accurate weather predictions when natural disasters may happen, and it is updated constantly," said Miyoshi. "For those who are vulnerable to natural disasters, like the elderly and people with disabilities, you want to give them enough time if they have to evacuate their home." Japan's weather agency has given the system a cautious embrace, saying it needed more tests to prove its long-term accuracy and potential weaknesses before being put to use. The Riken team have acknowledged that they cannot yet quantify how much better their system is compared to traditional forecasting methods. Other research teams have also developed promising technology, according the weather agency. "The Meteorological Agency is conducting its own research and we are also reviewing what many other research teams are doing," said weather agency scientist Kozo Okamoto, who participated in the Riken research project. "It takes a long time to verify whether a new technology can be put to real use," he told AFP.